Greetings, family and familiars, on what would have been Grandpa Robert Earl Ley Jr.’s 97th birthday. Been awhile, but the genealogy train keeps on chugging, with certain dedicated, extended relatives at the controls, making an unexpected stop every now and again. This is a dispatch from Mac and Brad Wilcox, distant cousins through the far-flung Ley line, and proprietors of the site Kin Connection. Today’s treat? 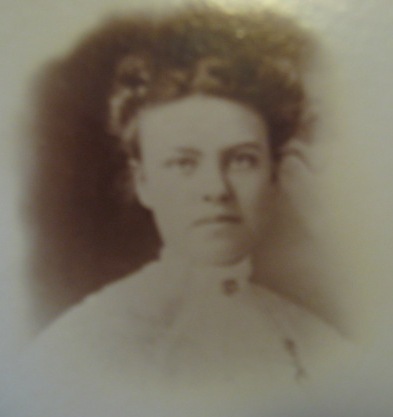 We finally get to pin down — or rather, gaze upon — a great-great-grandmother who remained the only ancestor of that generation for whom I hadn’t discovered a photo. And now we can see her for ourselves. 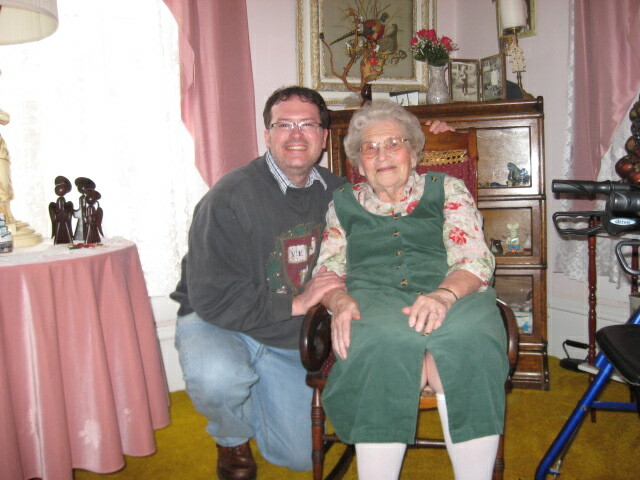 Meet Great-Great-Grandma Minnie Eillene (Hammersley) Ley! 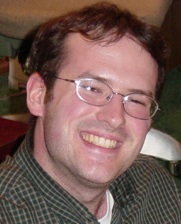 My brother Brad and I have about 3,000 photos and hundreds of documents done so far. Perhaps we are half-way. We came across the attached photos yesterday that were in a scrapbook maintained by my great aunt, Mary Ellen Wing (1891-1972). She was responsible for saving many of the photos and documents that we are all now enjoying. 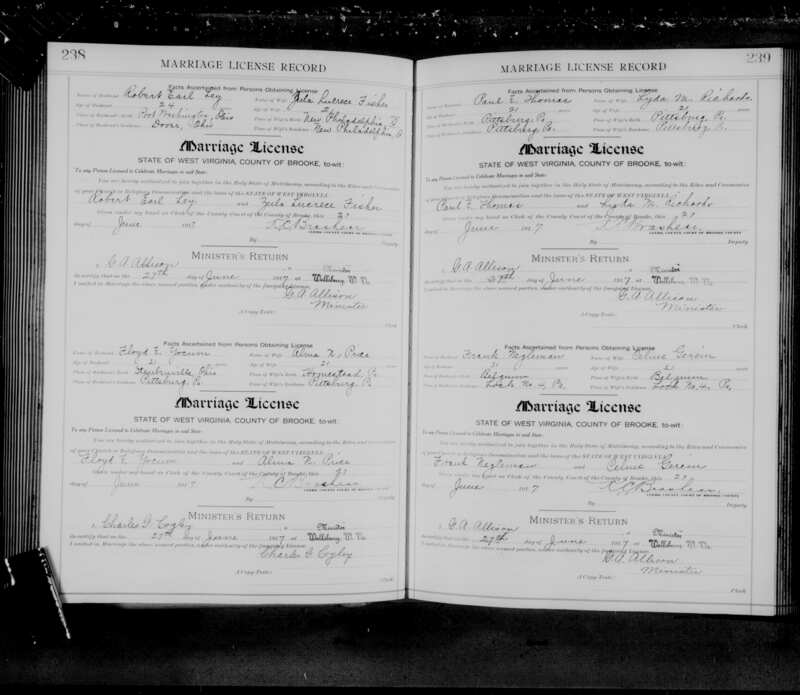 Mary, who wrote the identifications on these photos, was the youngest child of Adeline Sperling, who in turn was the youngest child of Abraham and Catherine Sperling. Unfortunately, neither photo was dated, but we have some educated guesses as to the details. One photo is labeled “Irma- Uncle Chris -Minnie Ley”. I am reasonably sure that the picture includes Christian Wiand (1844-1934), center; Minnie Eileen Hammersley Ley (1965-1929), at right; and Irma Haines Ley (1900-1945), daughter of Minnie Ley, at left. 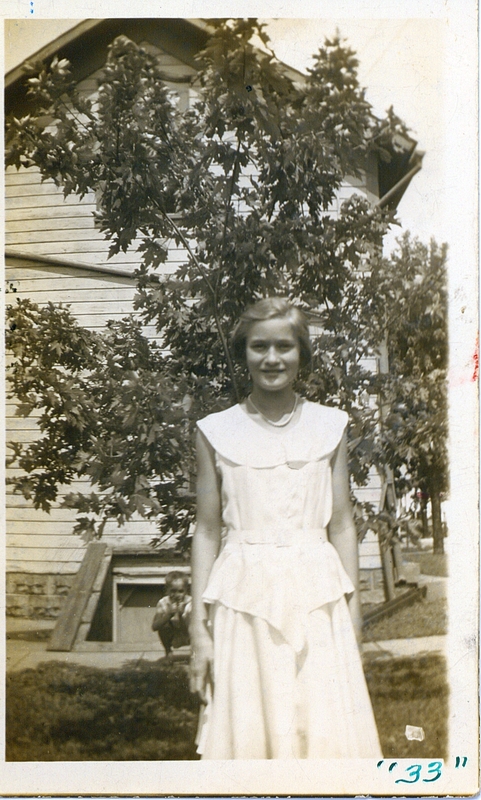 I suspect this was taken in the back yard of the Wiand home at the corner of Main and High in Port Washington. The foliage indicates summer, probably mid-1920’s. The other photo is labeled “Earl + sons + Uncle Chris”. 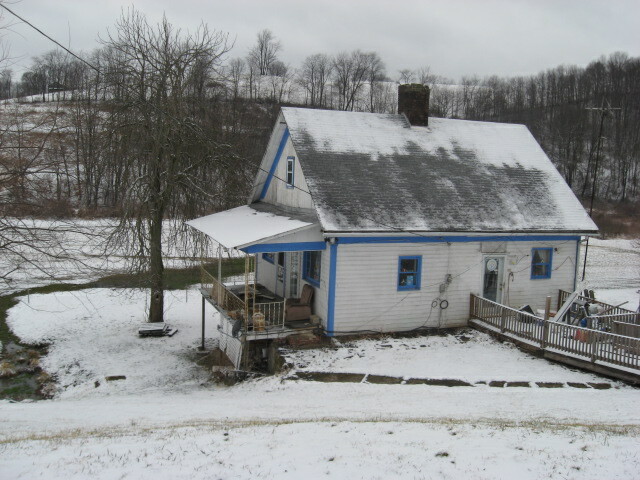 This photo also includes Christian Wiand and clearly was taken in the front yard of the Wiand house, since the house across the street, at the right edge of the photo, is still there, looking at Google maps. I presume “Earl” is Robert Earl Ley (1883-1959), at left. Robert Earl Ley Jr (1918-2008) is holding the baby, and Richard Earl Ley (1927-1933) is next to Christian Wiand. This photo looks like it was taken in spring before the trees leafed out. One guess as to the baby, which I think is a girl, is Mary Ellen Ley (1931-2011), daughter of Lester Ley and Daisy Nan Shively. Perhaps this was before/after her Christening, maybe in the Spring of 1932. Perhaps you can confirm this or set me right. I don’t know about you, but whenever I hear of a trove of forgotten photos, I burn to see what — more importantly, who — is in there. Mac and brothers, remember, shared the goods on fourth great-grandparents Abraham and Catherine Sperling, as well as the crucial details and a breathtaking glimpse of third Great-Grandmother Hattie (Sperling) Hammersley Wiand. Two crucial discoveries there were the cause of death for Great-Great-Great Grandfather James Hammersley, taken during a tragic accident while working on the Erie Canal; and the story of her second husband, Christian Wiand, a successful Port Washington hardware merchant who grew into more than just a stepfather/stepgrandfather to later generations of Leys. He was truly a member of the family. These and other photos reveal those gatherings in a way that invites you to step in. 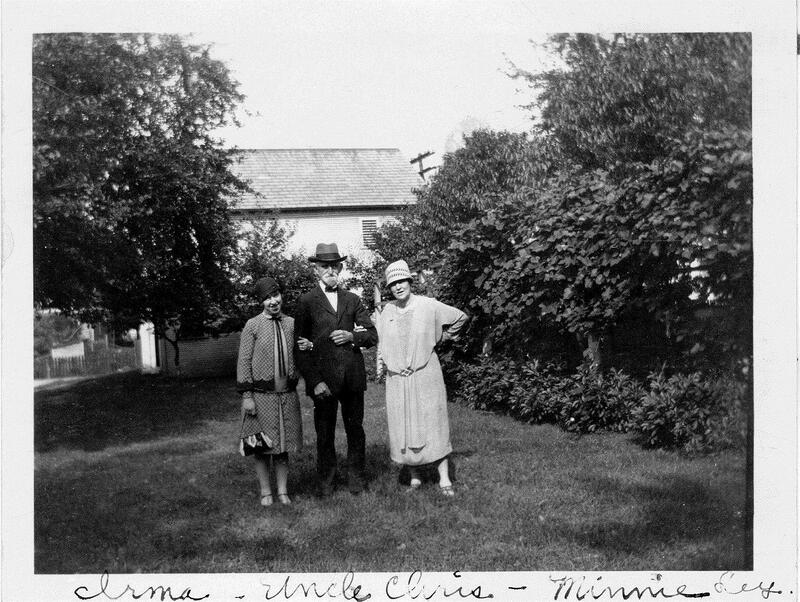 For the first time — for me, anyway — we meet my great-grandfather Earl Ley’s sister, Irma (Ley) Haines, arm in arm with her mother and step-grandfather. We again visit what I feel Mac has accurately pegged as the front yard of Chris’s place in Port Washington, though the criscrossing sidewalks and hard bricked corner of the place at first suggested to me a church. But maybe that’s the suggestion of the christening playing on my imagination. I can’t say for certain, though the dates seem to line up right. My first inkling is that Grandpa Robert Earl Ley Jr., youthful in the above photo, could even have been holding his brother Dickie. For that to have been the case, though, we’d be looking at a photo from September 1927 (88 years ago! ), and grandpa would be just 9. He looks older to me…. The only other photo I’ve seen of Dickie is the portrait below. So, if Mac is correct, this is another glimpse of father and sons, as well as a young relative. 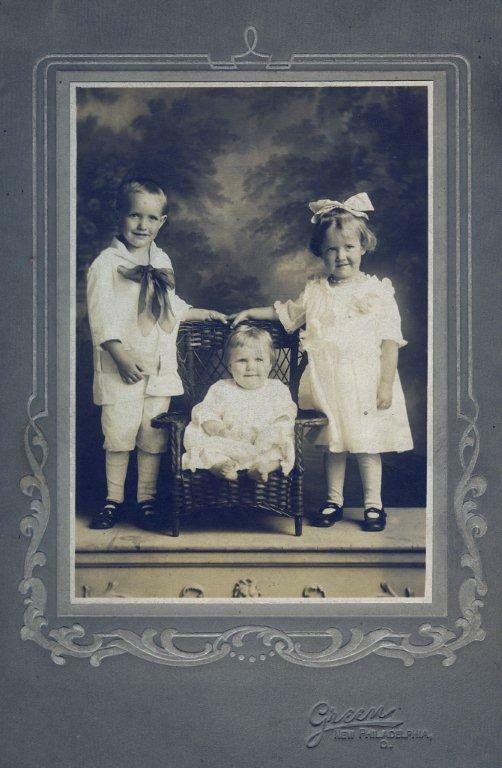 If the occasion is, indeed, Mary Ellen Ley’s christening in 1931 (I didn’t even have Mary Ellen in my working tree), then grandpa would be about 12-13, and Dickie around 4, which seems to fit the little boy in the photo. So, still some gaps to fill in. But we’ve bridged a crucial gap missing from the collection of ancestral faces on our tree. Hello, dear Great-Great Grandmother Minnie Ley. Richard “Dickie” Ley aboard a bicycle, early 1930s.